Under its own heat-sensitive resistance elements understand the temperature increase ΔT of the measured ambient temperature as a result of the allocation they heat (P = Ri^2, W) with the passage of the measurement current i. This excess temperature is an additional measurement error, depending not only on the current i but in the first place, the amount of heat that can be withdrawn to the environment. Heat transfer is determined by the material and size of the sensing element, as well as the state and thermodynamic properties of the environment. 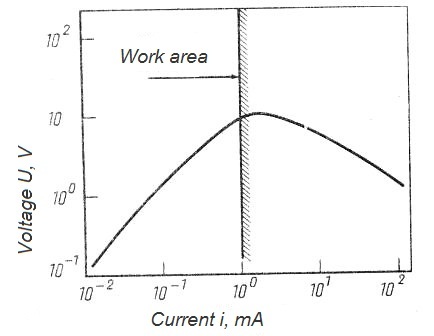 Firms that manufacture the sensing elements of thermometers usually indicate for each type of element the maximum permissible values of the current passing through it and the voltage drop on it in the form of a diagram (Fig. 1). The sensing element can only be used in the left ascending branch of the characteristic so that under certain boundary conditions there is no interference from its heating by the measuring current. For example, a platinum sensing element (RT 100) on a ceramic frame in a metal tube, when a current of 3 mA passes through it, heats in still water by about 0.01-0.02 K, and in still air - 0.1 K; the maximum current should not exceed 10 mA. In small NTC thermal resistors, the maximum current can be only a few microamps.